Are Aloe Vera Plants Angiosperms or Gymnosperms? How Long Do Aloe Plants Usually Live? Can Aloe Vera Plants Come Back to Life After Being Left Out in the Cold? Can Aloe Vera Plants Survive in Zone 5B? Aloe vera is an angiosperm plant because it flowers. Angiosperm plants have a true root system, leaves, stems and flowers. The roots hold the plant in place and allow the plant to absorb water and nutrients, while the stems move the nutrients around the plant and the flowers help the plant spread and grow. Aloe rust is actually a fungus that causes round brown or black spots to develop on aloe leaves. While unsightly, these spots rarely spread but are permanent. The best treatment is to prevent subsequent infection by preventing water from settling and remaining on aloe's leaves. 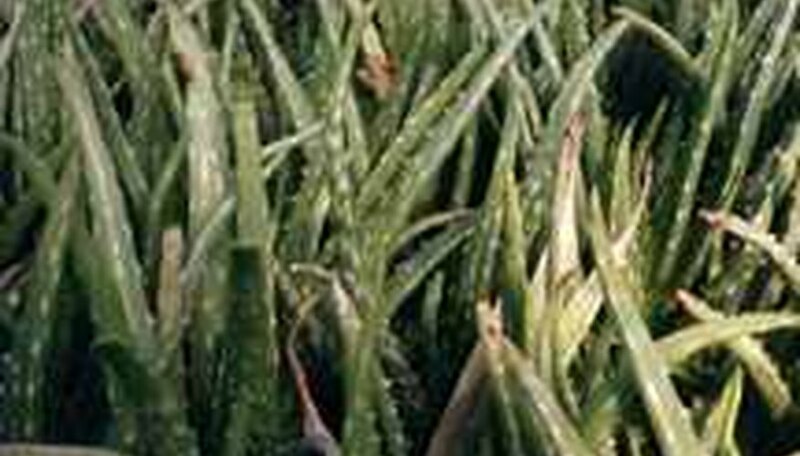 Basal stem rot is a fatal aloe vera disease that is caused by cold, damp conditions. The base of an aloe vera plant affected with basal stem rot will turn dark red or black and then quickly begin to rot. Discard affected plants and amend the growing conditions before planting new aloe vera plants. Bacterial leaf rot is caused by the bacterium Erwinia chrysantemi, which causes dark green, water logged splotches on aloe vera leaves. While caused by bacterium, leaf rot is always connected to over-irrigation and high rainfall in the area. Once the tissue has begun to rot, uproot the afflicted plant and discard it. Water the aloe vera plant. Feeding the plant sufficient amounts of water is crucial for the succulent to maintain its plump green leaves. Administer enough water to thoroughly soak all of the aloe vera plant's substrate material. Repeat the watering when the soil has dried to a depth of 3 inches. Feed the aloe vera plant a standard liquid or granular blooming fertilizer with a nutrient ratio of 10-40-10. Such products can be obtained from all garden stores and nurseries. Apply according to the fertilizer's label once in the spring when the aloe vera begins to grow with renewed vigor after its winter dormancy. Move potted aloe plants indoors if they are kept outdoors in areas where winter temperatures drop below 45 degrees F.
Cover the soil around your outdoor aloe plants with about 2 to 3 inches of mulch, such as bark or pine needles. Do this especially if your area gets chilly at night (below 55 degrees F). Water aloe plants sparingly beginning in the fall. Water only when the soil completely dries out (use your finger or a moisture thermometer). Then water each plant with only 1 to 2 cups of water. The sturdy aloe vera plant can last through droughts, shade and even being uprooted and replanted and still survive for up to 25 years. Clean your pruning scissors with rubbing alcohol to prevent any bacteria or disease from being spread to your new aloe cuttings. Choose a healthy-looking leaf from the lower part of your aloe plant that you would like to use to propagate a new plant. The leaf should be at least 4 inches long. Use your scissors to cut the base of the leaf where it connects to the plant to remove it. Use a paper towel to grab the leaf. Avoid touching it with your hands. Set your leaf cutting aside for a week to let the wound you made callus over. This helps to prevent the leaf from rotting. Dip the cut end of your leaf into your rooting hormone for about 30 seconds. Fill your plant pot with well-drained potting soil. Bury the bottom half of the leaf in the potting soil so that it can form new roots. Water your plant lightly to moisten the soil every three days for a month. Reduce watering to once a month after the first month. Aloe vera is a member of the Liliaceae family and grows naturally in tropical locations. It is frequently grown both outdoors and as a houseplant. Aloe vera is a perennial herb and is recognized by its thick, pointed leaves. These basal leaves are grayish-green to red in color and feature small teeth along the edges. Aloe vera is a succulent that produces clusters of small yellow flowers. 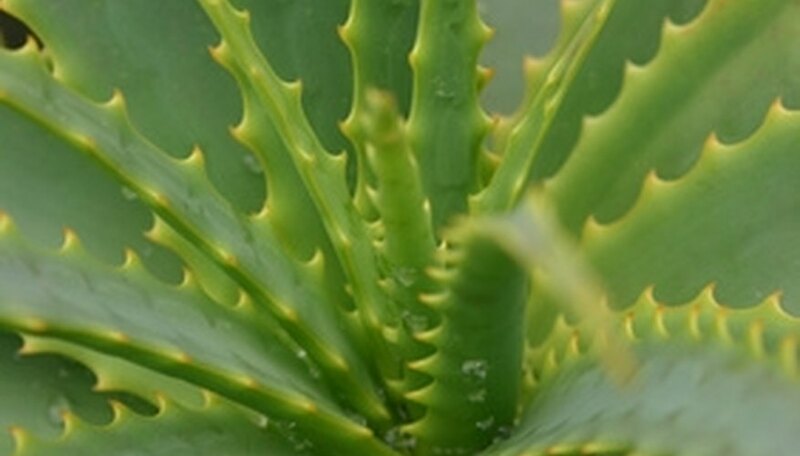 The sap of the aloe vera plant is commonly used in lotions and in its natural state to treat burns on the skin. Although useful for external applications, the sap should never be ingested, because it is a poisonous substance. When ingested, the sap of the aloe vera plant can cause abdominal cramping, red urine or diarrhea. Although poisonous, the sap has low toxicity and should not cause any lasting problems, according to the North Carolina University horticultural department. In most cases, symptoms last only a few minutes. Fill a flower pot with potting mix made for cacti. If you don't have cactus potting mix, make your own my mixing potting mix with gardening sand at a 1 to 1 ratio. Do not pack the mix into the pot. Tamping the soil firmly makes it difficult for the aloe vera to develop. Use a razor blade or sharp gardening knife to slice off a leaf of an established aloe vera plant. Select one of the large outer leaves; larger pieces develop larger root systems, and will grow faster. Cut a piece that is at least 5 inches long. Place the cut aloe leaf on a counter and allow it to air out for one week. The cut end must callus (heal over) before it is transplanted. An aloe leaf that is planted before its wound is healed will be vulnerable to disease and rot. Push the aloe leaf into the center of the flower pot after a week. Bury all but the top 4 inches below the surface of the soil. Do not water the cutting. Treat the aloe cutting as you would another aloe plant. Give it several hours of sunlight per day, but water rarely. Look at the plant to see if the green leaves are growing straight up away from the plant, or whether the tips are wilting downward. Tips that wilt down are an indication of root rot in the plant. Check the coloring of the plant to see if the leaves are yellow or black rather than green. If the leaves are yellow the plant is suffering from root rot but can be saved. If the leaves are black the aloe plant is probably too far gone to save. Grasp one of the leaves between you fingers and squeeze it gently. The leaf should feel firm and bounce back when you release your fingers. If it feels like an overripe banana, or if indentions remain where your fingers were located, then the plant has been overwatered. Look at the soil that the aloe plant is sitting in. If the top of the soil is soggy, then it has too much water. The soil should be moist to the touch just after watering but should be allowed to dry out in between waterings. Lift potted plants out of their containers to examine the root system for root rot. Root rot turns the roots brown instead of white and causes a slime to develop on the roots. Aloe comes from tropical Africa. Related species are used as an antidote to arrow poison, but we value the plant for its healing effect on burns, wounds and insect bites. Aloe is a succulent, and grows to a height of 12 to 16 inches. It has a fibrous root system producing long, tapering, stemless leaves. These light green leaves have spiky margins and are blotched with cream. The firm upright stems bear several bell-shaped, fleshy, yellow-orange flowers. Propagate from small, rooted offshoots at the base of the parent plant. It may be grown from seed. It prefers a rough, gritty growing medium and a well-drained, sunny location. It will also grow in partial shade. Aloe needs temperatures above 40 degrees, and is grown indoors in cooler climates. When grown indoors the offshoots can be removed and repotted when they are a few inches tall. Do not overwater. Cut the leaves as required. 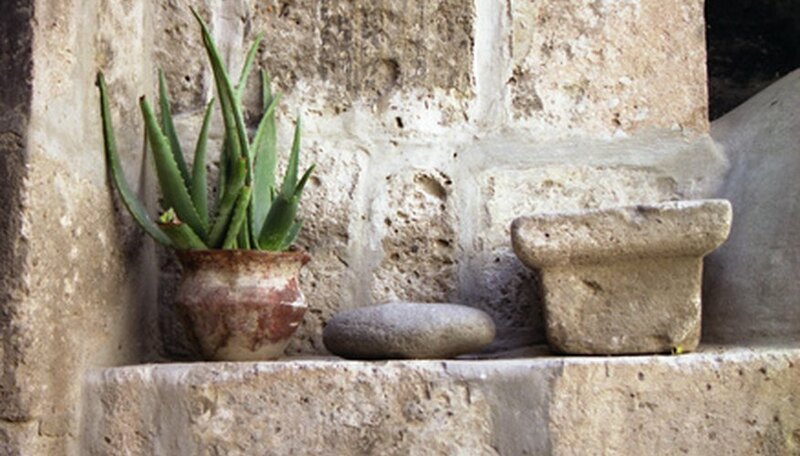 Keep a pot of Aloe vera on you kitchen windowsill for handy access. The fresh juice of the leaf blades can be applied directly to ulcers, burns, sunburn, and fungal infection. Aloe-emodin, an ingredient in aloe, is a powerful laxative and should always be used with caution. It can be combined with atinctureof caraway seed to prevent intestinal cramps and pain. Taken in small doses, it is an excellent digestive tonic. Tear a 2- to 3-inch portion off of the top of a leaf. Use care because the leaves are thick and spiny. Cut the leaf open lengthwise with a knife to expose the gel. Rub the gel on irritated skin. Discard the leaf after use, because the gel quickly loses effectiveness. Check your aloe vera plant when it’s about time to water next. The top ½ inch of the potting soil should be dry. Feed your aloe vera plant a good nitrogen-rich liquid fertilizer. Follow the packaging instructions carefully. Follow the feeding with a regular watering. This will help to flush the fertilizer through the plant’s root system. Fertilize the aloe vera plant with every other watering hereafter. Follow the manufacturer's recommendations. Provide a foliar feeding on extremely warm days in between fertilizer applications. Mist the aloe vera plant’s leaves with the same solution that you normally feed with, according to the packaging instructions. Apply enough to wet the leaves. Fill a pitcher or watering can with water, making sure beforehand that the soil on the plant is completely dry and is in need of watering. Make sure there is no water in the gathering tray at the bottom of your pot. Pour the water evenly and gently all through the bottom of the plant until completely soaked. Use a steak knife to cut away any drooping or dead leaves that have gathered towards the bottom of the plant. Aloe vera plants (Aloe barbadensis) suffer damage at 32 degrees F but will grow back if the roots are not frozen. Aloe vera plants handle heat better than cold. They survive temperatures greater than 104 degrees F.
Establish your aloe vera plant in fast-draining soil. Keep in mind that aloe roots grow outward, so plant the aloe in a wide pot with drainage holes. Keep the plant in a sunny window if conditions aren't suitable outdoors. Aloe needs a lot of light to bloom when it is mature and to grow a strong stalk. Do not over-water the aloe, since the plant thrives in arid conditions and too much water kills it. Before watering the aloe, feel the top couple inches of the soil to make sure it is completely dry before you soak it, each time you water. 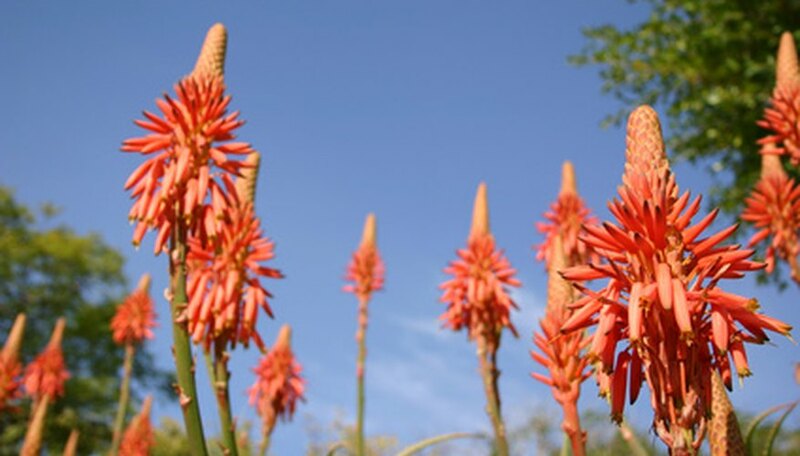 Fertilize the aloe vera plant every spring growing season with a diluted bloom fertilizer. This can be found at your local gardening store or nursery. Aloe vera is a perennial succulent native to the Mediterranean region. A member of the lily family, it is hardy to zone 9. It cannot survive outdoors in zone 5, although it is a popular houseplant in colder climates. Get a new planting pot that is several inches wider than the aloe vera plant's total diameter. The pot must have drainage holes at the bottom. Fill the bottom of the pot with one to two inches of gravel. This boosts the pot's drainage capabilities even further. Fill the rest of the pot with any standard soilless potting mix or a commercially prepared mix intended for growing cacti. 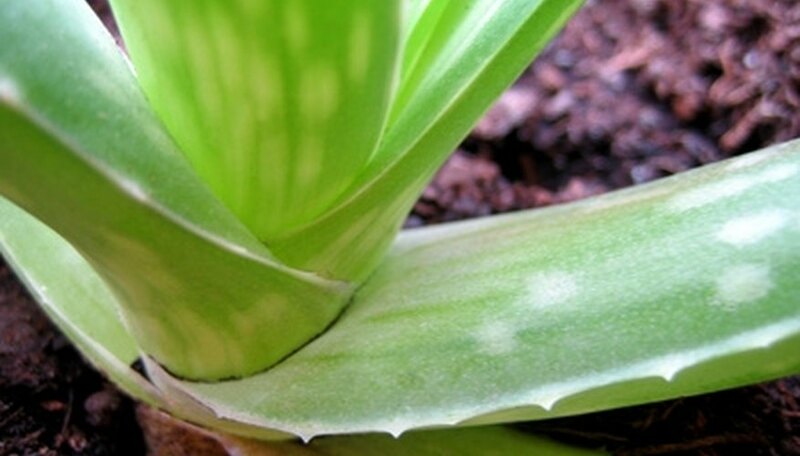 Turn the current pot of aloe vera on its side and tap its edges to begin breaking up the soil. Slip your hand around the base of the aloe vera and gently wiggle it loose. Dig a depression in the new pot's potting mix. Place the aloe vera plant's roots in the depression and cover with the displaced potting mix. Water the aloe vera. Repeat waterings every one to two weeks, or as needed to keep the aloe vera's leaves plump and green.